The ‘Oxford University bans Christian Union’ story has gone half way round the world, and it really shouldn’t have. Oxford’s Cherwell newspaper originally carried it: ‘Christian Union banned from Balliol freshers’ fair‘, which was kind of true, but swift enquiries to primary sources established a number of factual errors (or journalistic ’embellishments’) in order to sell copy, so it didn’t seem worth writing about. But then the Guardian waded in with ‘Anger as Oxford college bans Christian group from freshers’ fair‘; and the Telegraph with ‘Oxford college bans “harmful” Christian Union from freshers’ fair‘; and the Times with ‘Balliol College Oxford bans Christians from freshers fair‘, etc., etc (Daily Mail, Evening Standard, Daily Express, The Tablet, Premier, Christian Today…). This is Balliol, for Pete’s sake, where John Wycliffe, The Morning Star of the Reformation, was once Master (not to mention sundry bishops); and outside whose doors some eminent reformers were burnt at the stake. It has its own chapel, like most Oxford colleges: its very foundational ethos was Christian (and unlike some colleges [like St Antony’s], it hasn’t converted its chapel into a library or a gym). Talk about Chinese whispers… (can one still say that, or is it now considered racist?). Firstly, Balliol College banned nothing: it is highly unlikely that anyone with any authority in the College even knew about the matter until it hit the press. Secondly, the JCR (Junior Common Room – the term for the whole undergraduate population of a college) didn’t ban anything: it was a small faction of its organising committee. Thirdly, when the JCR as a whole heard about the actions of the secular zealots, they passed a unanimous motion (yes, unanimous) that such illiberal behaviour wouldn’t be tolerated and could never be repeated. Fourthly (and rather most importantly), the Balliol Christian Union reps were very happy with the amicable resolution and didn’t want any further publicity. Enter the eminent and renowned Professor Richard Dawkins. Predatory: preying naturally on others; seeking to exploit others. Nasty: very bad or unpleasant; behaving in an unpleasant or spiteful way; damaging or harmful. ‘Nasty’ is a valid opinion. Quite a few of Professor Dawkins’ own students find him thoroughly unpleasant, and they are entitled to do so, and he is entitled to shrug his shoulders. The University is committed to maintaining a working, learning and social environment in which the rights and dignity of all members of the University community are respected. The University has a network of Harassment Advisors in colleges and departments and runs a dedicated harassment line. For a senior faculty member, as Professor Richard Dawkins is, to accuse the Oxford Christian Union of being ‘predatory’ is really rather concerning. It means they are preying on the weak and vulnerable; exploiting loneliness or depression; manipulating, intimidating, abusing or misusing their power and position. 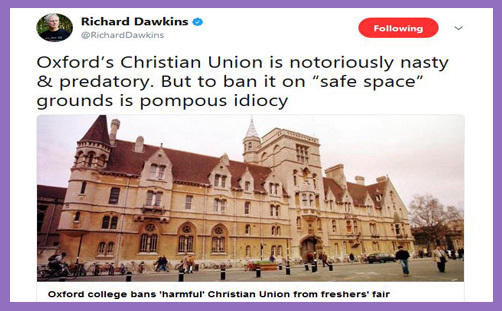 Richard Dawkins says the Oxford University Christian Union is harassing, not pastoring; that they are effectively bullying students into salvation. 4. Those in positions of authority, such as heads of division, heads of department, chairs of faculty boards and their equivalents, have formal responsibilities under this Policy and are expected to familiarise themselves with the Policy and Procedures on appointment. All heads of department and equivalent, and all other managers, have a duty to implement this Policy and to make every effort to ensure that harassment and victimisation do not occur in the areas of work for which they are responsible and, that if they do occur, any concerns are investigated promptly and effectively. It is his duty to ensure that students are not preyed upon by nasty, malicious groups like the Christian Union. He has a duty to report their behaviour so that it can be investigated “promptly and effectively” to ensure swift justice for the victims. Has he done this? If not, why not? Is he not in breach of his University’s own Harassment Policy? He says the Christian Union is not merely predatory, but notoriously so. So it is manifestly a chronic problem of which he has himself been aware for many years, if not decades. And what has he done about it? Is it not his duty to ensure the health and welfare of the student body, even if doing so must mean that he sides with the “pompous idiocy” of Balliol’s ‘safe space’ zealots of secularity? Or is he embellishing the truth – you know, impugning and defaming Oxford’s respectable and valued Christian Union – just to wade in on the story, boost his personal profile, and gain a few thousand more Twitter followers?